Product Sample: A beauty bag sample was provided to me in exchange for this honest review. 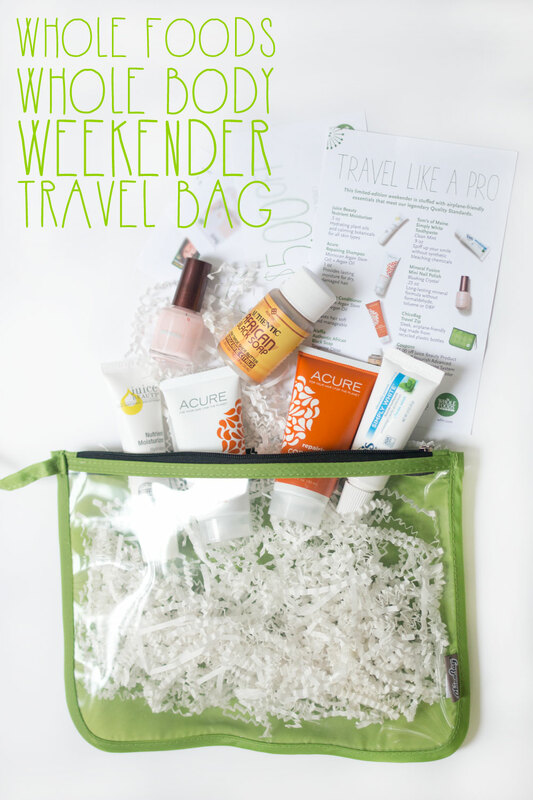 I’m pretty sure everyone knows about my beauty subscription addiction by now, so when I heard about the Whole Body Weekender Travel Bag from Whole Foods, you know I had to have it. Luckily, Whole Foods gave me a sneak peek before it launched and offered two to a couple of lucky winners! For $6.99 starting today, you can snag one of these guys at your local Whole Foods. (Find your nearest store via their store locator.) With six deluxe samples, a travel bag, and coupons, it’s more than worth the value. I had a few days to test the products out, so while I can’t provide a full review, I thought I’d share my first impressions and thoughts on each of the samples inside. Acure Repairing Shampoo (1 oz) – This smells just like marzipan, which if you aren’t familiar, is a candy made from almond paste. Yum! While this doesn’t suds up as much as normal shampoo, I found it to be sufficient to leave my hair feeling cleansed. Acure Repairing Conditioner (1 oz) – Like the shampoo, this one also smells like marzipan. Double yum! If you’re not an almond fan, I wouldn’t worry too much as I didn’t notice that the smell lingered. This conditioner left my hair feeling silky, soft, and shiny, which is just how I like it to feel after a shower! Alaffia Authentic African Black Soap in Tangerine Citrus (2 oz) – To be perfectly honest, I don’t think Tangerine Citrus is quite the right scent description. I’d say it almost smells more like lemongrass. While I can’t say it’s my favorite scent ever, I did like the texture and hydrating qualities, and the fact that it’s made in Olympia, WA. Tom’s of Maine Simply White Toothpaste in Clean Mint (.9 oz) – This is my first time using a Tom’s of Maine product, and I’m loving this toothpaste! It left my teeth feeling nice and clean, and I love the non-artificial-tasting mint flavor. Mineral Fusion Mini Nail Polish in Blushing Crystal (.25 oz) – I was most excited for this nail polish, as I’m forever in search of a pale pink nail polish that is opaque. Considering it doesn’t have any of the nasties (no formaldehyde, toluene, or DBP) AND is opaque after two coats, I’d say this is a winner! ChicoBag Travel Zip TSA Friendly Pouch – I am so excited about this bag! I know that sounds nerdy, but when we were traveling to Europe, I realized I didn’t have a good bag for liquids and my plastic baggies were not cutting it. Of course when I needed a bag like this none could be found anywhere! And now a chance to win your own! This one’s open to those 18+ and residing within the United States due to shipping restrictions. Thanks so much for understanding. P.S. A second bag giveaway will be posted on my Instagram this weekend, so be sure to follow along & enter there too! Which product would you want to try from the bag? Are you going to pick this up at Whole Foods? The Alaffia Authentic African Black Soap in Tangerine Citrus scent. I’m totally digging that nail polish although the facial moisturizer sounds amazing too! I don’t think you could go wrong with either! Thanks for entering, Kimi! If I were going to get married again, I’d pick that pretty nail polish up in a heart beat! You’re right that would make a beautiful bridal nail color! the bag itself! we are going to mexico in the fall, and i am determined to only take a carry on, so i need this little bag. and that nail polish, too. thanks! How fun, hope you have a wonderful trip, b, and thanks for entering! Shampoo that smells like marzipan? Sign me up! I love it too, thanks for entering, Amanda! I would want to try the nail polish! The color is just gorgeous! It really is! Thanks for entering, Emily! Haha, I know right? Love the bag! Thanks Olya! I thought the price was such a steal too! I adore that little nail polish! The color is so beautiful! Loving the color of that nail polish! Beauty Subscriptions are so addicting and fun! I seriously cannot stop trying them out! 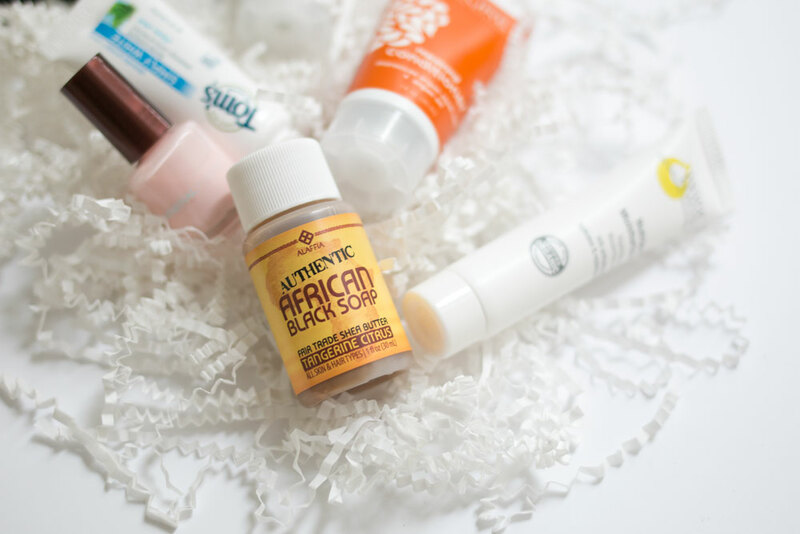 I would love to try the African Black Soap. I have read many great things about it. Wow, this is a whole lot of products for just $7! And since you bought it at Whole Foods, you know that you’re buying from respectable brands. I agree, though, the clear TSA bag is maybe the best part, haha. So true, and about the bag, I know right?! I really want to try the nail polish! The color is great! This is super cool! I haven’t been to Whole Foods in forever but I might have to go check out their beauty products. I’ve seen that Tom’s toothpaste at TJ’s but have been too nervous to try it, so I’m glad to know you like it! I’ve heard such great things about Juice Beauty – would love to try their moisturizer! Beautiful photos! What a fun bag of treats! Haha, I know what you mean! Thanks for entering, Mickie! I love the Mineral Fusion Mini Nail Polish in Blushing Crystal! I would love the try the nail polish! I quite like Tom of Maine products. I’ll be looking to stock up on them when I head State-side. Clearly I need to try more of them, as this was my first experience with Tom of Maine! Wow that is an awesome bag of goodies for 6.99! Your pictures are just fabulous! Thanks for sharing the giveaway! Definitely recommend it for dry hair – mine is too! Thanks for entering, Natalie! The product in the Weekender bag that I would like to try most is the Acure Repairing Conditioner. The nail polish and Acure organics products!! I want to try the alaffia authentic african black soap the most. 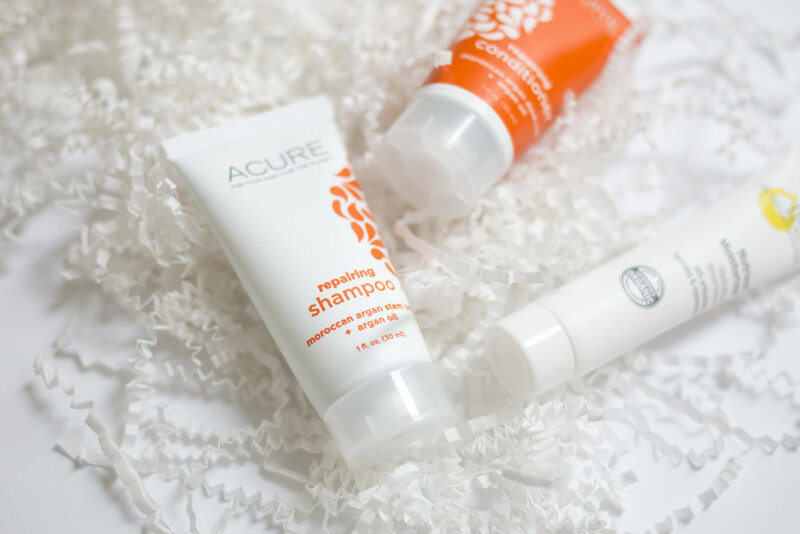 Would love to try the Acure Repairing Shampoo. I have the Acure shampoo that smells like lemongrass and really like it. The mini nail polish looks so pretty. I would most like to try the Acure shampoo and conditioner.